attending to the myriad of details involved in ensuring a smooth journey to the title company. The internet provides powerful tools so that we can assist clients throughout the twin cities metro area. With the addition of team members to handle contract to close details, a marketing specialist, partners in title work as well as mortgage options, our service guarantee remains stellar. We love helping our clients — we are in a people business and work with care, diligence, business savvy, and enjoyment. 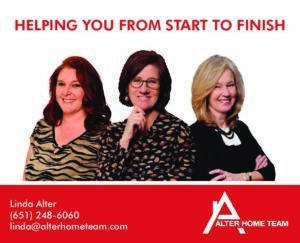 We have been where you are: a first time buyer, selling and buying a home with young children, divorcing with or without children, downsizing from a larger home, a condominium resident, a duplex buyer and resident, relocating to the twin cities, a lake home owner, a real estate investor long term and short term. We have referrals available to help you make home repairs before you sell or after you buy. “Contributing to the Common Good” is another facet of our real estate business. We contribute a portion of every real estate transaction to community non-profits, to KW Cares, and volunteering our time. Referrals have always been a large source of our business, as well as past clients. See our testimonials page for reviews. Linda is a fantastic agent!